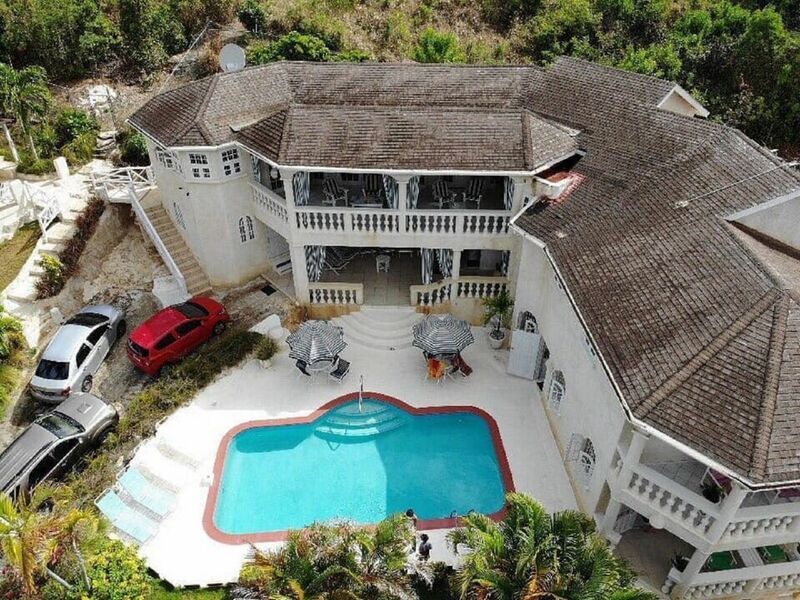 Sea Symphony villa is located on the northwest coast of Barbados, 3 miles from the historic town, Speightstown which offers a wide variety of shops and fine restaurants. The villa enjoys the waters of the Caribbean Sea at the cozy, natural secluded Fryers Well beach, ideal for swimming and snorkeling. The six en suite bedrooms all have ocean views. You must capture those spectacular sunsets from the open living plan of the living room with its patio - favourite spot for sunset cocktails. Sample the chef's specialties in your three dining choices - main dining downstairs which opens onto the pool deck, intimate dining upstairs overlooking the pool, or outdoors in the gazebo surrounded by the flourishing garden foliage. A day is not complete unless you laze around the pool with its open or covered decks and still keep in touch using your complimentary high speed WiFi. A tranquil, relaxing, rejuvenating atmosphere. The six tastefully appointed bedrooms are evenly distributed between upstairs and downstairs. They all have en suite bathrooms, robes, portable hair dryers, air-condition and ceiling fans. The master bedroom 'AWAFIA' suite has a king size bed, his and hers vanity, remote control plasma screen television,a walk-in closet and its own private balcony overlooking the Caribbean Sea. The 'PLANTATION' suite boasts a delicately decorated queen size four poster bed . The other four bedroom suites, with their unique Caribbean features, each has two double beds which can be configured to a king size bed. The villa's daily staff ( chef ,housekeeper , laundress and pool attendant ) will be happy to cater to all your needs. Free laundry service is included. There are many nearby attractions and activities, and these can all be easily arranged from the villa. Golf lovers have a choice of golf courses.There are a variety of water sport activities nearby.Horseback riders and tour lovers can enjoy the fantastic view of the north and east coast as well as inland gullies, hills and fields.Or, if you prefer, just enjoy sunbathing and strolling along your cozy, secluded white sandy beach. You are met in the arrival hall of our airport [ Grantley Adams Airport / BGI ] and transported to the villa. After your vacation, we also transport you back to the airport. One transport from the airport to the villa and one from the villa to the airport is complimentary. The excitement of activity is a stone’s throw away and with numerous choices including golfing, water sports, fine dining, shopping and a variety of attractions in Speightstown and Holetown. For the more adventurous, the East coast is also nearby for those who want to experience the rugged terrain and the Atlantic Ocean, which is good for surfing and is a regular stop for international surfing. A spectacular view of the ocean and also individual views of the ocean from all rooms. Sunsets are varied and very colourful. Many areas to sit and relax in a tranquil, peaceful atmosphere, away from the hustle and bustle. Indoor and outdoor dining choices. Still stay in touch with your available complimentary high speed WIFi and cable television. Daily staff - chef, housekeeper, laundress, pool attendant - enjoy full relaxation with no household chores to worry about. Proximity and easy access to the natural beach which is good for snorkeling. All bedrooms have en suite bathrooms. Each bathroom has a portable hairdryer, 'comfort' robes, towels, shampoo and soaps. Each bedroom has its own split system air-condition. The washing machine is exclusive for Sea Symphony. All detergents are provided. The clothes dryer is exclusive for Sea Symphony. High speed wireless internet is complimentary. Bring your lap top. Bath, beach and kitchen towels are provided. The living room flows on to its patio creating an open living plan. The view is spectacular. This area is popular for sunset cocktails. The refrigerators have ice and water dispensors. The main dining room opens on to the pool deck. More intimate dining is upstairs. The gazebo is popular for grilling. A butler is optional. The television channels are cable. There is a DVD player - bring you choices of DVDs. There are some novels for you to browse through. There are some board games , puzzles and playing cards for you to enjoy. The outdoor pool is exclusive for Sea Symphony and is available all year round. The staff work daily. You provide the groceries your desire and the chef will prepare breakfast, lunch and dinner. A butler is optional. The housekeeper / laundress will maintain the villa and prepare and clean the guest laundry. The prefect choice for friends, family, weddings, anniversaries, celebrity getaways, retreats, couples and honeymooners. Sea Symphony is an exclusive luxury villa, on Barbados' north west coast - by the beach, with private pool, car, cable TV, fax, DVD, wireless internet, treadmill machine, full daily staff, all bedrooms A/C with en suite bathrooms, ceiling fans, gardens, gazebo, complimentary pick up to and from the airport. Other Activities: Sight seeing - Harrison's Cave, Sea Turtles, Andromeda Gardens, Flower Forest, Animal Flower Cave, Wildlife Reserve, Farley Hill , Earthworks Pottery.